Southern Toughening Glazing in Epsom supplies, processes and fits a wide range of glass for any purpose. We can process, bend, bond and cut glass for a wide range of architectural, design and functional purposes from rooflights, to walkways, staircases to balustrades. And we can apply decorative techniques to your specification including sandblasting, back painting, colour interlayers and film application. Our range of glass includes toughened, laminate, fire resistant, anti-slip, acoustic reduction, switchable, tinted and mirrors. 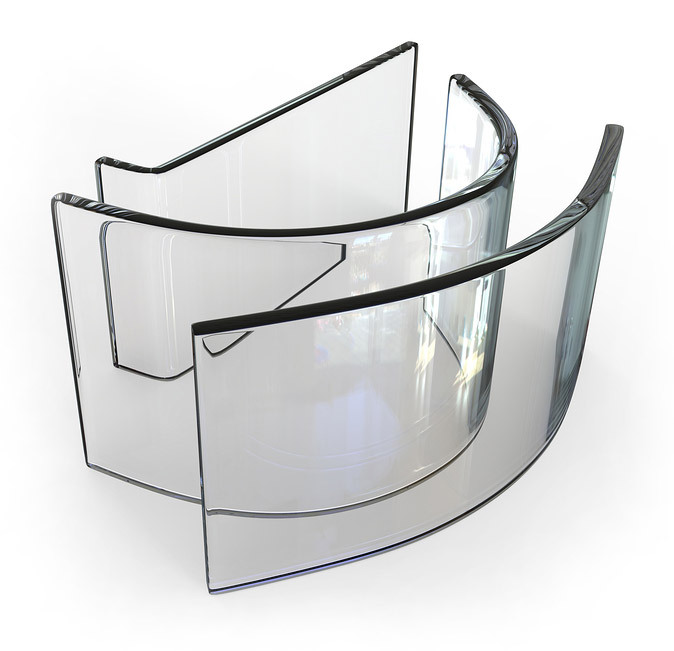 Clear float and low iron glass is available in thicknesses from 4mm-19mm. We supply toughened glass for domestic and commercial use. Our toughened glass is formed from an annealed soda-lime silica glass heated to a high temperature and cooled quickly. It is five times stronger than regular glass, up to 19mm thick and can come in a maximum size of 3000mm wide x 5000mm long. Southern Toughening Glazing supplies bent glass with a thickness of 5mm to 19mm. We can work with architects, designers and homeowners to create bespoke curves up to a radius of 2.5m. We have access to advanced CNC machine technology to offer glass cut with precision, uniformity and versatility as well as increased efficiency. Using this automated technology we can supply glass that has been processed in a variety of ways – with polished edges, cut outs, drilled holes, sandblasting and custom shaped. However you need your glass we can supply it for balustrade panels, countertops, shower screens, flooring and stair treads. Southern Toughening Glazing can supply and fit laminated glass in a wide range of appearances from clear to opaque, with bespoke decoration or with coloured interlays in a huge spectrum of colours. This very strong material provides sound and UV protection, and comes in sizes up to 6000mm x 2800mm. Working with architects and designers Southern Toughening Glazing can supply and help fit bespoke glass constructions for commercial, retail and residential buildings. One hundred times stiffer than traditional laminate, SentryGlas interlayers provide safety in extreme conditions as well as long lasting clarity. The material is ideal for fittings where high resistance to shock and wear is a priorty, and for use in minimally supported glass structures. Double glazed units of up to 6mx3m can be supplied for large expanses of glass and structural glazing with high energy efficiency ratings and solar control. 10mm or 12mm thick glass in a variety of patterns is available both for internal and external applications such as stairs, bridges, walkways and walk-on roof lights. Southern Toughening Glazing can supply and fit fire resistant glass for use in partitions, glass panelling and fire doors to enable you to meet fire regulations and to act as a barrier and restrict damage. We can supply 7.2mm Pyroguard with double sided resistance for 30 minute integrity and 11.4mm Pyroguard for 60 minute integrity only applications. Other integrity only fire rated glass can be supplied up to E1120 rating. We also provide Lunax frameless fire doors in ratings of E30, E60, EW30, EW60 and E130. Fire rated walk-on glass floor panels are available in sizes to 1100mm x 1500mm at EI30 and EI60 fire ratings. If you require a bespoke glass structure, glass furniture or bespoke display case we have the UV bonding technology to produce it for you. This UV adhesive leaves an extremely strong and invisible bond. Southern Toughening Glazing supplies and fits AMIRAN anti-reflective glass for applications where you need complete transparency with no distracting reflection. This is an ideal material for shop windows, displays, viewing galleries, stadiums and much more. If you need quiet spaces our noise reduction glass can dramatically reduce background noise. The acoustic reducing interlayers, thicker panes and increased gap between sheets reduce sound transmission significantly. We can supply, design and fit decorative glass in a range of formats – from sandblasting to bespoke designs, to coloured lamination, back painting, and decorative films. There is no limit to the aesthetic effect of sandblasted glass. We can turn your designs into a beautiful, eye-catching product, branded backdrop, window or screen. We can also supply and fit sandblasted glass partitions to create private areas in your home or commercial premises. We can spray paint the back of clear float or low iron toughened glass with a paint colour of your choosing (BS, RAL, Dulux or Farrow & Ball) to create a dramatic and eye catching feature perfect for kitchen splashbacks, reception desks, shop counters or wall cladding. With the innovative coloured interlay system, there is no limit to the colour scheme of your glass interiors or exteriors. Coloured interlays can be combined to produce a vast spectrum of colours for use on balconies, windows, panelling, balustrades, walkways and any other glass-based construction. Our fabric and decorative interlays can give glass structures a completely unique look. The interlays can be used to create an interesting textual appearance, with regular or irregular patterns or printed bespoke to your own design.